Vanilla is such an extraordinary ingredient. As basic as that little black dress in your closet, it can be pulled out time and again, bringing class, flair and comfort every single time you wear it. Vanilla’s flavor and fragrance has come to embody comfort in kitchens worldwide. However, given its popularity it has been overused in unfortunate ways, like bad imitation extract and exaggerated aromatic imitators. No wonder it has tried to be replicated though, vanilla comes with a high price tag. But here is the thing: you can make a vanilla bean go a long way. You can extend its exuberant properties and multiply its uses by flavoring other basic ingredients with it. My favorites are salt, sugar, simple syrup, oil and vinegar. In turn, the resulting vanilla salt, vanilla sugar, vanilla syrup, vanilla oil and vanilla vinegar can be used for long periods of time and in so many ways. What’s more, making these vanilla products will not only enrobe your kitchen in its fragrance (and romance if you are aware of the legends that surround its birth), but it will make for memorable gifts as well. As far as what to use them on, imagination is the name of the game! I have sprinkled vanilla salt on fresh tomatoes as well as peaches ready to be grilled. Vanilla sugar is decadent baked on pies, in sweet crepes and in tea or coffee. The vanilla vinegar and oil make fresh salads shine and cooked vegetables go nuts. Last time I baked baby potatoes, I drizzled on some vanilla oil and spooned a bit of Mexican cream on top. The simple syrup is marvelous for everything from drinks, to desserts and specially drizzled on ice cream. p.s. Use sterilized glass jars (or ran in the dish washer) with tight fitting lids. p.s. 2… Feel free to double up the amount of salt, sugar, simple syrup, oil or vinegar with just a single bean. Pour the salt in a medium mixing bowl. Using a small sharp knife cut the vanilla bean and then split the halves lengthwise. Open each half and scrape the seeds from top to bottom into the salt. Mix them up with the salt, making sure the seeds don’t stay clumped up but are well distributed. Pour the salt into a small glass jar and insert the vanilla pieces. Let it sit for at least 48 hours before using, the more it sits the stronger the vanilla presence it will have. Store at room temperature. Pour the sugar in a medium mixing bowl. Using a small sharp knife cut the vanilla bean and then split the halves lengthwise. Open each half and scrape the seeds from top to bottom into the sugar. Mix well to make sure the seeds don’t stay clumped but are well distributed. Pour the mixed sugar into a small glass jar and insert the vanilla pieces. Let it sit for at least 48 hours before using, the more it sits the stronger the vanilla presence it will have. Store at room temperature. Pour the vinegar into a small glass jar. Using a small sharp knife cut the vanilla bean and then split the halves lengthwise. Open each half and scrape the seeds from top to bottom into the vinegar, as thoroughly as you can. Add the vanilla pieces to the vinegar as well. Put the lid on the bottle and close tight. Shake it for a good 30 seconds. Leave it at room temperature. For the first couple days, shake it a couple times a day. Let it sit for at least a week before using. In small saucepan, combine the sugar with the water. Using a small sharp knife split the vanilla bean from top to bottom, without going through the other side, and then cut it in half. Open the slit in each vanilla half and scrape the seeds into the water/sugar mix. Drop in the scraped vanilla pieces as well. Set the saucepan over medium heat. Stirring occasionally, heat for 2 to 3 minutes or until sugar is completely dissolved. Remove it from the heat once it does. Let it cool and pour it along with the vanilla bean pieces into a small glass jar. Close the lid. Refrigerate up to 6 months. Pour the oil into a small saucepan. Using a small sharp knife cut the vanilla bean and then split the halves lengthwise. Open each half and scrape the seeds from top to bottom into the oil. Set the sauce pan over medium low heat and heat for 4 to 5 minutes. Remove from heat and let it cool. 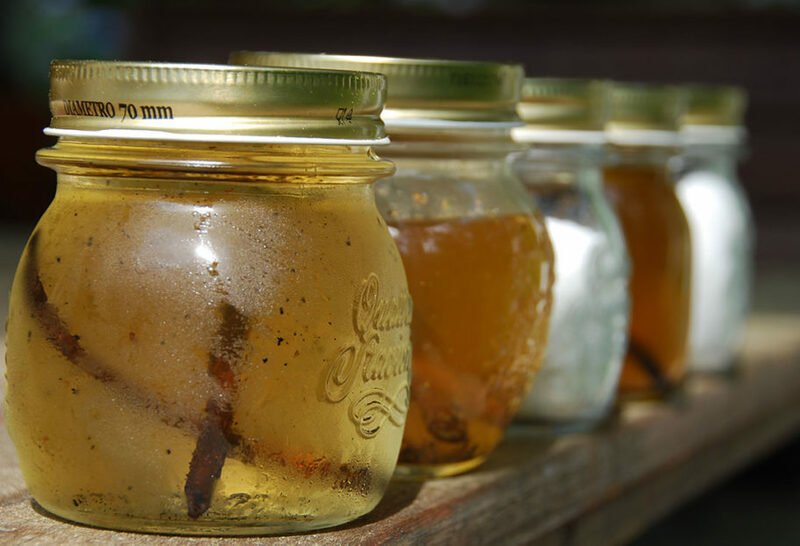 Pour the oil into a clean glass jar with a tight fitting lid; cover and place in the refrigerator. Store in the refrigerator for up to 6 months. Bring to room temperature before using and don’t use it for deep-frying food. I used the vanilla sugar in a batch of your Jamaica water (hibiscus flowers) recipe and it was incredibly delicious. Thanks, Pati! Yay! So glad you like both recipes Meg. Guess what I am making on my next day off?? Crazy Goodness! Now I am really anxious for my homegrown tomatoes to hurry up!! I bet I could use the vanilla simple syrup in my coffeeeeeee!! As always, thanks Pati! ? Yes you can! It’s delicious. What are these used for? Like baking? Are these like vanilla extract? I am sure you will LOVE these! Thank you for all that you are teaching us. What a blessing to us.